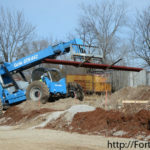 Taking advantage of the warm and dry weather, the Bourbon County Law Enforcement Center project continues to move forward, as a steel structure appeared on the property over the past week. 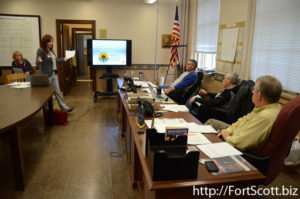 The Bourbon County Commissioners and members of the Sheriff’s Department met Tuesday with engineers and architects involved in the project to receive an update on what has been accomplished and what steps are coming up in the process. 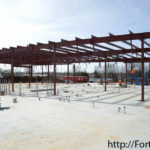 Earlier in January, the concrete foundation was laid. 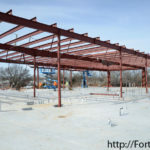 As of Wednesday, January 25, the steel frame of the building had also begun to be put in place at the piece of land just east of the Briggs Auto Group. 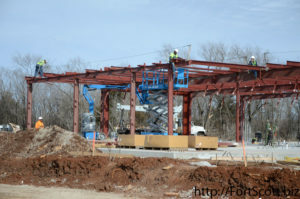 The steel building is expected to be up entirely by the end of February. 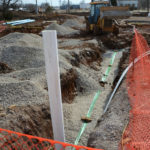 The site’s utilities are also being installed, although that step is progressing at a slower pace because of the rock. The cell pods are to be delivered and set the week of February 13, with the stairs and mezzanines being delivered the following week. 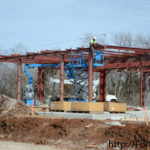 Other equipment is set to arrive in March while others, such as the kitchen equipment, are scheduled to be on site in July. “It’s all falling together,” Kevin Rost, of Goldberg Group, Inc., said during the meeting. 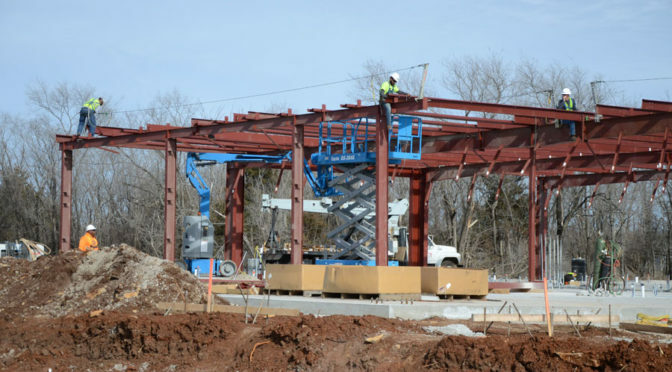 Project manager Gary Walker, of Universal Construction Company, pointed out that, although the building seems to be moving quickly now, it will soon appear to be moving slowly once the exterior is complete. But in those months, he said work will be accomplished inside the structure and out of sight. 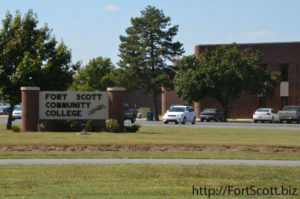 Fort Scott Community College continues through its spring semester with a number of upcoming events, including the beginning of baseball and softball seasons, a family game night and an active shooter response training course. See the calendar below for details on recent and upcoming events. FSCC Women’s Basketball at Brown Mackie College, 2 p.m.
FSCC Men’s Basketball at Brown Mackie College, 4 p.m.
FSCC Women’s Basketball at Labette CC, 5:30 p.m.
FSCC Men’s Basketball at Labette CC, 7:30 p.m.
FSCC Softball at North Arkansas College, 1 p.m. and 3 p.m.
FSCC Softball at Ottawa University JV, 12 and 2 p.m.
FSCC Women’s Basketball at Hesston College, 5:30 p.m.
FSCC Men’s Basketball at Hesston College, 7:30 p.m.
FSCC Softball at Cowtown Classic in Fort Worth, Texas at 11 a.m., 1 p.m., and 5 p.m.
FSCC Softball at Cowtown Classic in Fort Worth, Texas at 9 a.m., 11 a.m., 4 p.m.
Fort Scott Community College will host a two-day ALICE instructor training course from 8 a.m. to 4 p.m. on February 23 and 24 at the Danny & Willa Ellis Family Fine Arts Center. The ALICE (Alert, Lockdown, Inform, Counter and Evacuate) instructor training course is designed to teach participants proactive survival strategies to address violent intruder or active shooter incidents. These strategies can be utilized by schools, hospitals, businesses and places of worship. Those who complete the course receive certification in ALICE training, which allows them to bring ALICE strategies back to their workplaces to train others. Additionally, registrants gain access to exclusive ALICE resources. The registration fee for the course is $595 per person. To register, visit alicetraining.com. For more information, contact Clayton Whitson at 620-223-2700, ext.3260 or claytonw@fortscott.edu. ALICE is in line with recommendations from the U.S. Department of Education, the Department of Homeland Security (DHS), and the Federal Emergency Management Agency (FEMA). For more information about ALICE, visit alicetraining.com. Fort Scott Community College Theatre students Jackie Neher, Linda Shinkle, Jared Oshel, Jason Clissold, Royce White and Stephanie Rice performed a scene from “The Bald Soprano,” during the opening ceremonies of the Kennedy Center American College Theatre Festival (KCACTF) on Monday, January 23. Stephanie Rice, Jared Oshel and Jason Clissold also participated in the Irene Ryan Scholarship Auditions during the KCACTF. Photo Credit: FSCC. 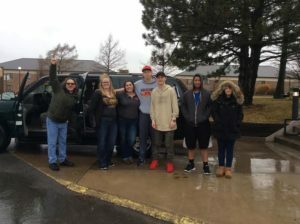 Pictured left to right: FSCC Theatre Director Lawrence Alford with FSCC students Jackie Neher, Linda Shinkle, Jared Oshel, Jason Clissold, Royce White, and Stephanie Rice. 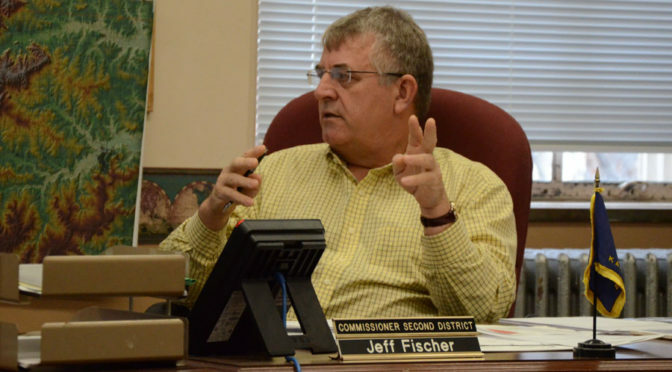 After his first three weeks in office as the Bourbon County District Two Commissioner, Jeff Fischer continues to learn about his new role as well as look for ways for the county to have success. Born and raised in Hammond before leaving in 1995 for Arizona and then Florida, Fischer moved back to the area in 2005. A licensed professional engineer, he spent time working in Kansas City before tiring of the long commute. Fischer serves as a pastor at the Fort Scott Apostolic Christian Church, but now leads in the county in a different way after being elected in 2016. Fischer said part of the logic for his campaign was because of construction projects happening in the county and his experience in contracting. Fischer added he sees a number of other concerns in the county including dropping population leading to a shrinking taxpaying base, high taxes discouraging new industry and the need to leverage resources available. Fischer said one of his first goals in his new position is to compare Bourbon County to other counties as benchmarks, to see how they are successful and if there are ways Bourbon County can follow their example. 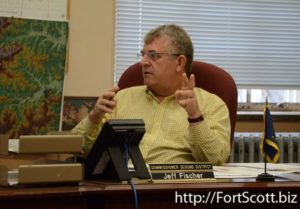 Already, Fischer said he has learned a great deal about what he is able to do as a commissioner as well as what is not allowed, such as meeting with a fellow commissioner outside of a scheduled meeting, even if only for a casual conversation. 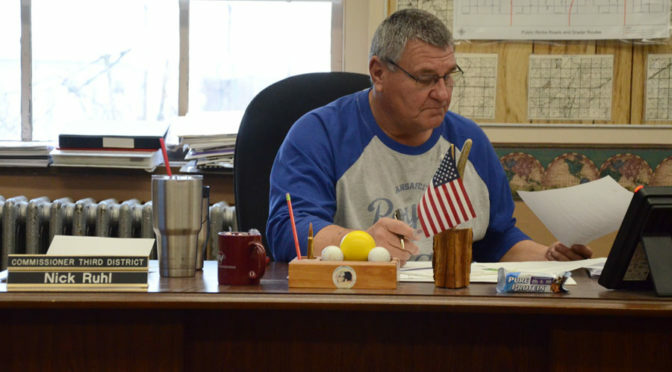 After weeks and months of campaigning as well as months of sitting in on meetings before finally being elected, Nick Ruhl is settling into his role as Bourbon County District Three Commissioner. 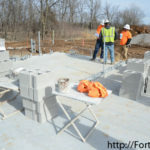 Ruhl has lived in Bourbon County all but five years of his life, serving the Fort Scott Fire Department for 20 years and owning a construction company for eighteen years. But at the request of friends, he decided to serve the community in a different way. “A lot of people came to me and asked me to run,” Ruhl said, saying he knew something needed to be done to keep from spending too much money while bringing in other funds for the county at the same time. Ruhl said he is looking forward to finding ways to invite new businesses, such as by not driving them away because of high taxes. Since filing as a candidate in spring of 2016, Ruhl said he has probably missed only six of the bi-weekly county commission meetings. After those months of hearing about the issues and concerns of the county, Ruhl said he is excited and ready to take on the new position. 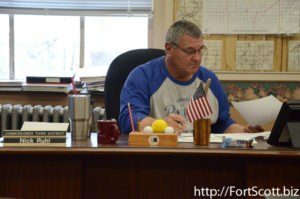 Since being sworn into office on January 9, Ruhl and fellow new commissioner Jeff Fischer have attended training from the state and have heard a number of reports concerning county resources and other concerns. 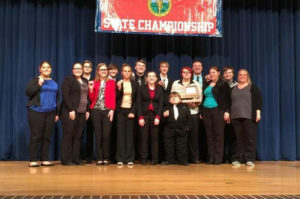 Unified School District debate teams continued their successful season January 20-21, with one team being named the runner-up at a state tournament in Lyons, Kan., while other local teams also moved far into the event. 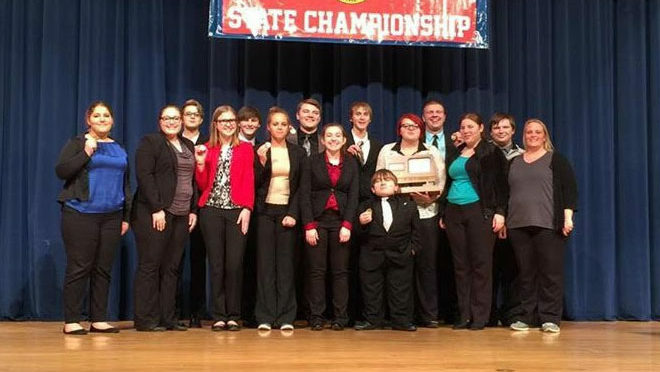 “We had a great weekend at state debate last Friday and Saturday,” debate coach Amber Toth said. 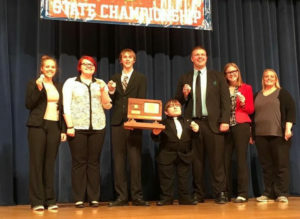 Zach Humble, Seth Cross, Joe Adams and Isabella Provence with alternates Madison Toth and Emma Humble competed in the four-speaker event, and walked away the state runner-up after falling to Bishop Miege, who was named the champion of the tournament. Four teams also competed in the two-speaker events, with three of those teams moving on to the double-octofinals out of the 70 teams. Teams Darby Toth and Rebekah Sweyko, and Chloe Studyvin and Dalton Womeldorff fell in that round, while Sara Al-Shawish and Tayton Majors advanced to the final 16 teams. “Our kids had an amazing season and a tremendous state showing,” Toth said. 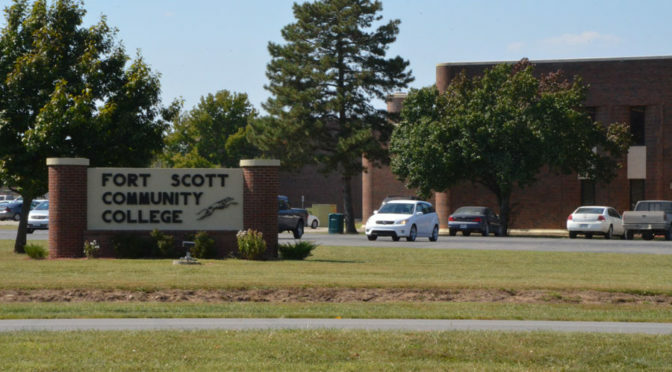 Fort Scott Community College will host a two-day ALICE instructor training course from 8 a.m. to 4 p.m. on February 23 and 24, at the Danny & Willa Ellis Family Fine Arts Center. The registration fee for the course is $595 per person. To register, visit alicetraining.com. For more information, contact Clayton Whitson at 620-223-2700, ext. 3260 or claytonw@fortscott.edu. In recent years, Bourbon County received a Blue Cross Blue Shield grant for $500,000 as part of the Pathways to a Healthy Kansas program, to be used to improve the health of county residents by various means. 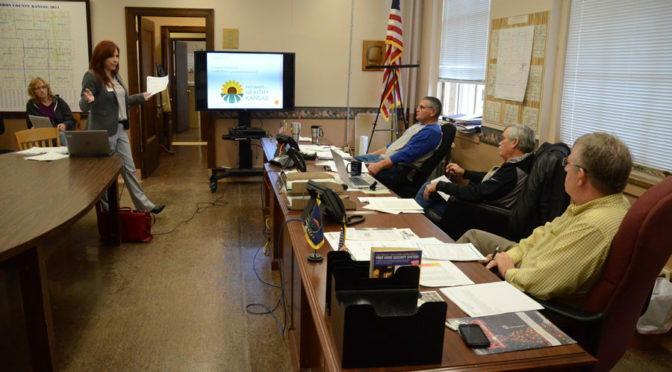 Jody Hoener of Mercy Hospital, who also works with Pathways and the Healthy Bourbon County Action Team met with the Bourbon County Commission January 17, and shared the needs of the program and how the commission could be involved. Hoener said, since 2012, Bourbon County has ranked in the bottom 10 percent of Kansas counties concerning the health of its residents. Out of the 101 counties recently ranked, Bourbon County has been ranked as high as 97th in health, including factors such as level of activity, access to healthy food and tobacco use. The commissioners agreed to cooperate and meet with Hoener and other team members as the county forms a Bicycle and Pedestrian Transportation Plan, to do an inventory of the trails and sidewalks available to the community. An assessment will also be made to see how accessible healthy food is for county residents as well as how the Highway 69 corridor can be used to promote activity and good health such as through bicycle lanes. “Not only is the transportation plan important, but the access to healthy food is important, too,” Hoener said. The commission would be consulted as the plan is formed and as priorities for the county are developed. The opinions of the county residents are also considered through the use of surveys and public meetings. The study of the county’s needs and creation of the plan, with the assistance of the PedNet Coalition – Pedestrian and Pedaling Network, will cost about $55,000, paid for out of the Pathways grant. Uniontown will have a separate plan to help meet their specific needs. “I think it’s a good solution,” commission chairman Lynne Oharah said of the plan and the teamwork between the county and the Pathways teams. Bourbon County is also looking at becoming involved in the WorkWell Kansas program, promoting worksite wellness at businesses by providing incentives up to $10,000 per participating business. By promoting wellness in the workplace, Hoener said employers can decrease rates of illness, injury and absenteeism among employees, such as by decreasing the sedentary rate, the amount of time employees spend sitting at a desk each day. Each participating business will have a team of representatives that will attend workshops and form a plan for their businesses. The county commissioners voted to be involved with the Pathways program by being members on some of the boards, which included focuses such as schools, worksites, food and retail, restaurants, community policy, healthcare and resident community well-being. Commissioner expressed the importance of promoting health in the county and taking advantage of the grant while the funding is available. The Fort Scott Community College Library and Student Voice organization will host a game night on Thursday, February 2, from 5:00 to 9:00 pm in the FSCC Library. The event, free and open to the public, will include video games, board games such as Monopoly and The Game of Life, and games from Steve Jackson, Soda Pop Miniatures, Ninja Division and Indie Game Alliance. The FSCC Library is located on the second floor of Bailey Hall on the FSCC campus at 2108 South Horton in Fort Scott. For more information, please contact Susie Arvidson, FSCC Director of Library Services, at 620-223-2700, ext. 3441. The Young Professionals League is again holding their annual fundraiser for the Beacon, but this year decided to sell enchiladas instead of hosting the soup line as they had previously. Current YPL president Bailey Lyons said they moved away from the soup line in order to be more efficient with the YPL members’ time as well as the money that went into it to purchase ingredients. Since the enchiladas are ordered in advance, there will not be an excess amount of food. Local churches made monetary donations to help pay for ingredients this year. Lyons said she had used enchiladas as a fundraiser in the past for Relay for Life, and they had been so well-received that she had gotten requests for them in years following. Lyons said the YPL hope they will again be successful in raising funds for the local food pantry. “This is the Beacon’s largest fundraiser of the year,” Lyons said, saying the organization counts on the YPL fundraiser, including it in their annual budget. The homemade enchiladas can be ordered by the dozen for $20, with any combination of beef, chicken or cheese enchiladas. The enchiladas come in an aluminum pan ready to bake or freeze for a future meal. 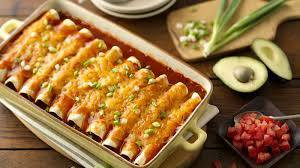 The enchiladas must be ordered by Wednesday, January 25, either by calling Lyons at 620-224-7795, or by ordering online at the following link: https://www.ypl-bbco.org/enchiladas/. The pick-up date is Saturday, February 4, between 2 and 5 p.m. at the Kennedy Gym. If buyers are unable to pick them up at that time, Lyons said they can arrange a delivery. Lyons said they have already had businesses order enchiladas for their employees for meals or giveaways. The enchiladas will also be available by the Super Bowl for parties. 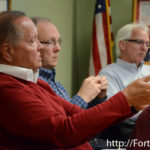 The Fort Scott City Commission approved two zoning changes on the south side of town as well as decided to move forward with a conditional use permit during their meeting Tuesday evening, which drew a full room of residents with differing opinions on the land’s use. Deputy Chief and Fire Marshal David Bruner presented the requests to change a piece of more than 50 acres just south of the Kansas Department of Transportation from agricultural to heavy industrial, and a second, smaller plot south of the Jayhawk and Liberty Bell Road intersection from agricultural to commercial. Martin and Bourbon County Economic Development Council president Steve Buerge both said the city is always trying to find businesses interested in purchasing the land near the Industrial Park to continue building the city towards the south. 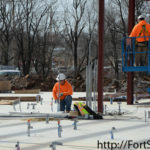 But in recent years, few businesses have shown interest because of the nature of the terrain as well as the lack of a workforce in the city with an unemployment rate of only 4.3 percent. But the Kraft family and others involved have expressed interest in using some of that land to bring a vet clinic and a dirt bike track to the community. The rezoning and special permit approved by the commission allows them to begin planning for those projects. 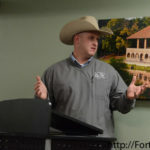 “Great West Vet Clinic is something we feel like will be a great addition to Fort Scott,” Nathan Wells said during his first presentation concerning the new veterinary services they plan to bring to Fort Scott. The clinic will provide care for both small and large animals, such as through surgeries, dental care, grooming, boarding, water therapy and radiology. It will also host laboratories for the study of artificial insemination (AI) and in vitro fertilization (IVF) for cattle, attracting students interested in training in that field. Wells said their goal with the clinic is to keep business local, such as that of owners of horses who said they often travel hours and out of state for such care for their animals, and also to make it a destination since the place for studies on AI and IVF will be one of the only such places available in the country. 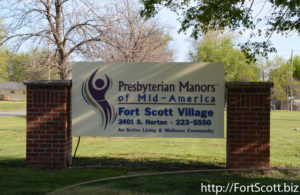 The second piece of land was rezoned to make it possible for a tiller track to be put in for dirt bike races, which Wells said would be held several Saturdays from March through October each year according to their current plan, bringing in racers and their families who would utilize local businesses while in Fort Scott. 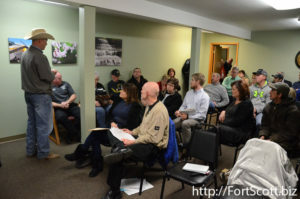 A number of citizens present at the meeting raised concerns over the track due to noise, dust and the atmosphere it might bring, while others spoke in favor of it because of the new business it would bring and its entertainment factor on a piece of property no other business had shown interest in because of its uneven terrain. Wells said those invested in putting in the track will do everything possible to cut down dust, such as through using sawdust and spraying water on the track regularly, as well as the sound by setting specific regulations on the bikes and also using vegetation and other barriers to help shield the sound. Some residents said they did not believe those steps would have a significant impact on the sound, which could decrease property values, interrupt quality of life for the residential areas there and could deter other business from coming. “If we get this wrong, this could have, I think, a very devastating effect on our community,” attorney Charles Gentry said, speaking on behalf of the Countryside Addition residents. 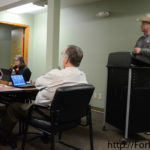 “I have mixed emotions about it,” commissioner Sam Mason said, but he and commissioner Randy Nichols both said they are in favor of moving forward with the zoning and the permit to give Wells and others involved an opportunity to continue their planning so they can bring further details to the commission. 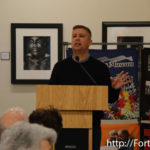 “We need to work together as a team to ensure that this is successful and that we continue to take care of the people and the concerns they have,” Wells said of the importance of their partnership with the city. The conditional use permit for the track will be drafted by the city staff, including any regulations they desire as well as an expiration date of the permit, allowing them to reverse the decision if the track seems to be hurting the community. With the draft complete, the commission will then decide to approve that permit or not. “This is by no means the end of the discussion,” commissioner Jim Adams said, saying the members of the commission have a lot of information to digest and consider. 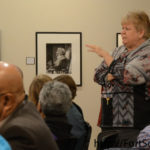 Fort Scott Community College celebrated Martin Luther King, Jr. Day Monday with their annual Lunch and Learn event, welcoming members of the community to participate in group discussions on the needs of the city and county. 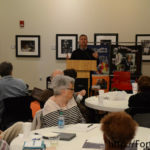 “I think it’s a good time to take a day out and talk about topics,” Gordon Parks Museum director Jill Warford said to the nearly 80 people that attended. The Rev. 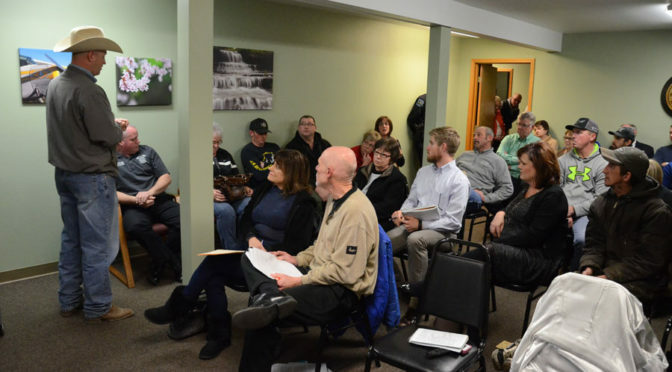 Dr. Jared Witt led the group into discussion questions, pointing out that despite diverse backgrounds, different political opinions and religious beliefs, it is important for members of the community to have conversations about how to move the city forward. 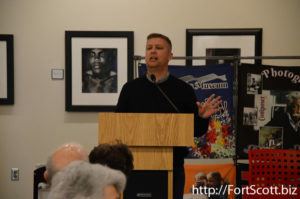 To be able to overcome those differences, Witt said people must focus, even though it is “a very noisy time,” and also grow up, taking responsibility for their own lives instead of remaining passive. 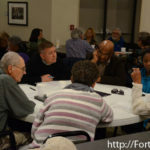 The people present discussed topics including what changes they would like to see in the community, how to make those changes happen, why is the holiday celebrated and what assets they can use to help such as their time and influence. 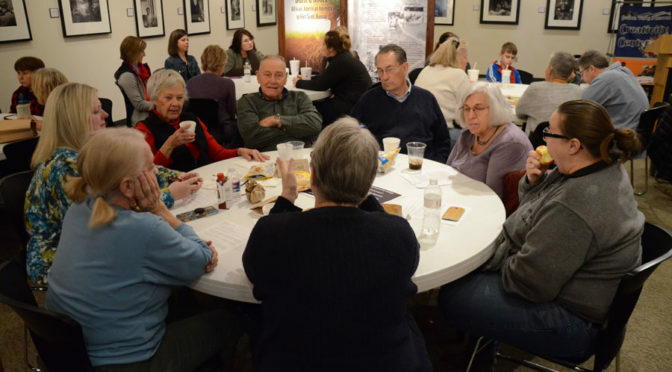 Some points raised during the conversations included the need for both mental and physical changes, such as the need for honest conversations concerning issues such as racism and tolerance, recycling in the county, a support of the arts, improving connections with college students in town and the need to involve young people in similar conversations. “Talk isn’t enough,” Witt challenged those present, saying discussing these changes just once a year will not accomplish much. 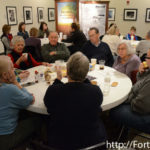 Warford and Witt both said they are interested in beginning Sunday Suppers in upcoming months, when groups of residents interested come together for a meal to share ideas. Roundtable discussions will also be held for younger college and high school students. Fort Scott Presbyterian Village has issued a call for entries for the Art is Ageless® juried exhibit to be held April 14 – 24, 2017. Entries of artistic works will be accepted from any area artist who is 65 years of age or older to exhibit and/or compete for an opportunity to be featured in the 2018 Art is Ageless calendar. Artists may choose to enter the exhibit only. For the competition, works are to have been completed in the past five years (since January 2012). There are nine categories, as well as designations of amateur or professional. Works to be entered for judging need to be at Presbyterian Village by April 6. The Art is Ageless® Program encourages Presbyterian Village residents and other area seniors to express their creativity through its annual competition as well as art classes, musical and dramatic events, educational opportunities and current events discussions throughout the year. 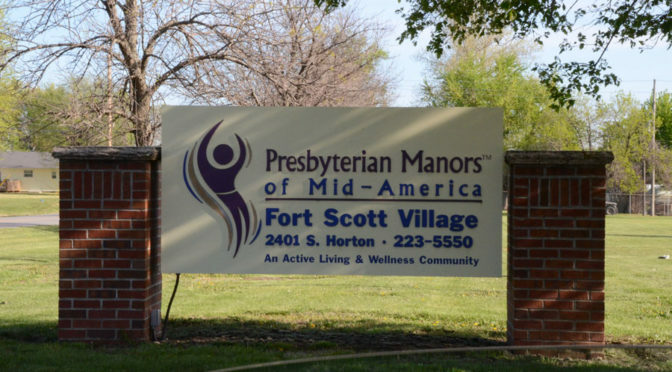 Entry forms and information can be picked up at Fort Scott Presbyterian Village, 2401 S. Horton or by contacting Anicia Robinson or David Sorrick at (620) 223-5550 or by email at dsorrick@pmma.org. Or go online to ArtIsAgeless.org to view rules, download an entry form or enter online.